In 1975, Agostini took his revenge on Phil Read and won the 500cc championship. However, younger riders were begining to come through and he decided to return to MC Agusta as a privateer in 1976, alternating his appearance on track with a Suzuki 500. A year later he finished his career on a Yamaha. Following this, for two seasons he raced single-seater F2 and F-Aurora cars with little success. 1942: Agostini is born in Brescia, son of a wealthy Italian industrialist. 1963: He wins the 1963 Italian 175cc championship aboard a Morini and gets his big chance when Morini factory rider Tarquinio Provini moves to Benelli. Count Alfonso Morini signs Agostini. 1964: Agostini wins the Italian 350cc title and proves his talent by finishing forth in the Italian 350cc Grand Prix at Monza. 1965: He is signed by MV Agusta for a full-time ride in 350 and 500cc world championships. He takes his first premier class win at the Imatra circuit in Finland. 1966: He wins the first of his eight premier class world titles, which starts a run of seven in succession. 1968: From the West Germany Grand Prix on the famous Nurburgring to the Ulster GP in 1969, Agostini records 20 successive victories, nearly a third of his total tally in the premier class. 1972: Agostini enjoys his best-ever season as he claims 11 wins, while he wins 10 races in three other seasons during his career. 1974: Having dominated Grand Prix racing with MV Agusta, Agostini wins his first premier class GP for Yamaha. 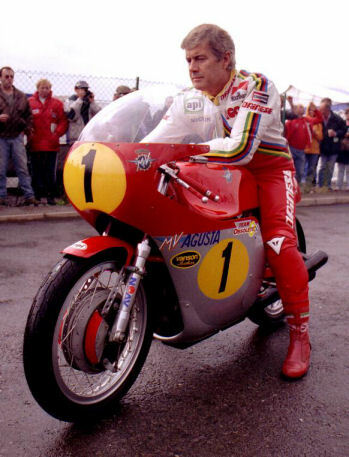 1975: Agostini claims his eigth world title and his only one not riding an MV Agusta as he creates history on a Yamaha. It is the first 500cc world championship for Yamaha, the first in the class for a two-stroke machine and is the first time MV Agusta lose the title since 1957. 1976: Agostini wins his last race and the 122nd of his career back on an MV at the Nurburgring. 1977: At the age of 35, with 68 premier class wins and 54 other GP successes, he retires. His last GP is the 1977 British GP at Silverstone.